We explore into 4 E’S of community development with which we believe we can bring about rapid and sustainable progress in any marginalized community. Education in Nepal is not something you take for granted. Although statistics shows around 82% of the youth between 15-24 are educated (Source: UNESCO), the reality is quite different. There are no schools in the remote areas of the country and the few that exist in a nearby locality are not easily accessible or affordable due to geographical and socio-economic barriers. In other places there are schools but not enough teachers, not enough classrooms for the children to fit in and not enough resources to learn from. They may know how to write their own names but they don’t have enough resources to wisdom. This is where change is required. We deem education a birth-right and, therefore, do not want to see any child deprived of it. It is this sole aim that has given our cause a meaning—a cause that we shall be defending despite all odds because we care. And, we want to keep working and expanding until we see these little kids living their dreams. Indeed, dreams should not be limited to mere literacy; we want these children to have an access to IT, one of our key priorities. We want awareness, wisdom and open-mindedness cultivated in them. Above all, we want them to be strong and bold, and to act as a catalyst for change to guarantee a better tomorrow. Our work next extends to empowerment of youths and women. We have got so many poor communities whose youths are early drop outs or have been denied access to education. The youths who are supposed to be the holding pillars of a nation are sometimes becoming a burden to the nation. In such scenario, it is an imperative that we provide such youths with simple trainings with which they can make their living. Agro based trainings, agriculture, animal husbandry, carpentry, plumber training, driving or other simple arts of living. Similarly the women who spent the whole day in a house engaged in unproductive activities are given various workshops and trainings on sewing, stitching, embroidery, handicrafts, weaving carpets etc. This is the second step to restoration of independence of people in deprived communities. This is an age of employment inflation where the number of employment opportunities are always in a massive deficient to those who are seeking it. So creation of jobs are rather a sustainable solutions than seeking one. Our project is always committed to providing local people with proper jobs. Be it the aspect of school or community, we are creating numerous jobs to these underprivileged people. We also help promote self employment to those trained and empowered individuals by providing initial capital in a form of revolving fund. Social justice is an important aspect of peace and prosperity of a nation. Unfortunately the under developed nation like ours always have a negative index in terms of social justice. Most of the crimes and unethical behavior that takes a nation towards jeopardy is due to lack of justice. The corrupt form of bureaucracy and unstable government is the result of the same. We need responsible citizens who are at all times abided by the moral grounds. Value education therefore is indispensable for the upcoming generation to be a responsible ethical citizen as the society gradually brings an end to socially unjust practices. EN project model is dedicated towards overall prosperity of marginalized communities through comprehensive usage of educational and empowerment methodologies. It covers the majority of social and economical disparities to self sustain such underprivileged communities. It is a spiral model concept that we replicate and improvise as necessary as we take it along every other deprived community. EN Project basically runs with direct co-ordination with local unit, which we call Community Task force. We empower, facilitate and monitor this unit to prosperity of the community. This governing body of community is preferably a group of women to encourage gender equality and women empowerment. 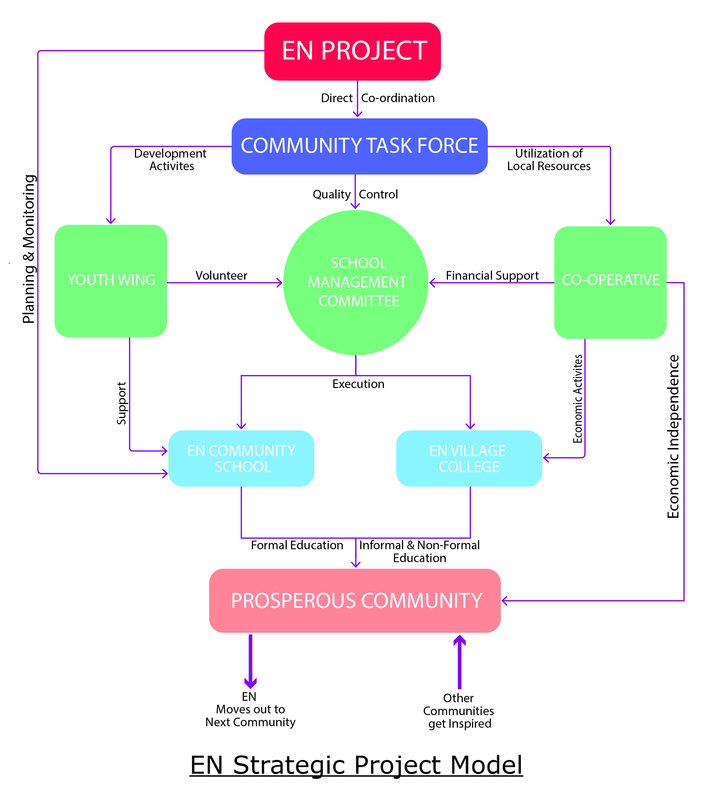 The Community Task force works with three aspects of the community. Youths are the indispensable force to development of any community. Apparently, the youths in our context are compelled to work in low paid precarious jobs in India and other gulf nations. Community task force arranges trainings and self-employment opportunities to retain youths for developmental activities in the village. School Management Community is responsible to provide free and quality education to the children of the community through community school. It also manages a vocational school which we call EN village college to other members of the community. This college is responsible for the recovery of economic independence specially to an aftermath of April 25 mega disaster. The co-operative is a separate entity of Community Task Force that manages financial and developmental activities in an institutional manner. This is an effective method of encouraging saving credits and investment activities. We plan to build self-sustained communities with these aspects and move along to different underprivileged communities in the same manner. We seek to create spiral impact of what we do to connect and convert many marginalized communities into prosperous ones.